Figure made by Robert March. Surfaces studied by Monge in 1807, Roger Iss in 1985.
the cuspidal edge being the helix: . 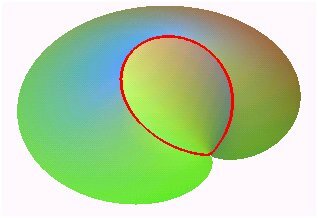 the directrix being the plane curve: . 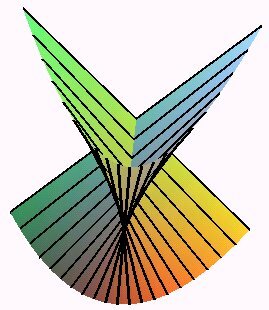 The area of a portion of surface is equal to the area of the projection on xOy divided by . 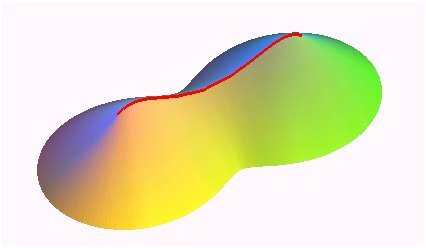 A surface of constant slope is a surface for which the slope with respect to a reference plane remains constant at all points. 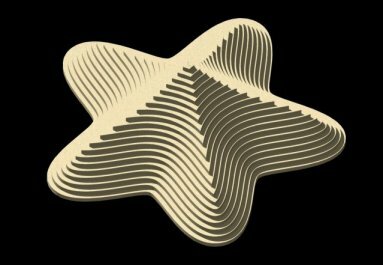 In other words, the tangent plane forms a constant angle different from zero with a fixed plane (or with a fixed line, normal to the previous plane); the surfaces of constant slope are therefore to surfaces what the helices are to curves. 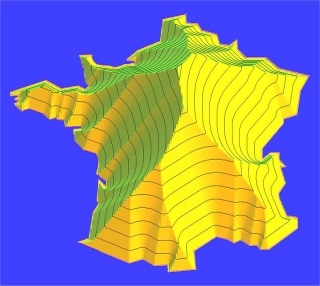 The slope lines of such a surface, assumed to be of class C2, are linear and the tangent plane is constant along each of them; the surfaces of constant slope are therefore portions of developable surfaces. 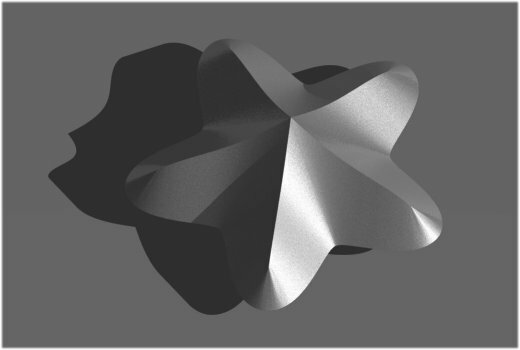 Inversely, a developable surface, other than a cone or a cylinder, is a surface of constant slope if and only if its generatrices are always tangent to a helix (which is the cuspidal edge of the surface). - the slope lines, for a given vertical direction, are linear. - the level lines are parallel. 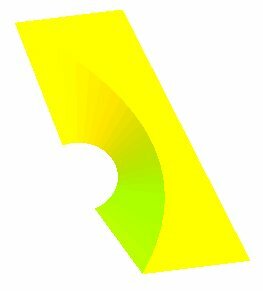 - envelope of a plane forming a fixed angle with a given plane. - portion of a developable ruled surface the generatrices of which form a constant angle with a fixed plane (in other words, which all have the same slope), in yet other words, the directrix cone of which (union of the lines passing by a given point and parallel to the generatrices) is of revolution. - portion of cone, of cylinder or of tangent developable of an helix. 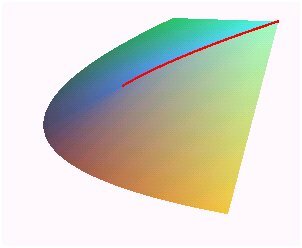 A complete surface of constant slope is entirely characterized by one of its level curves (called directrix) and the angle , or by its cuspidal edge and the angle . 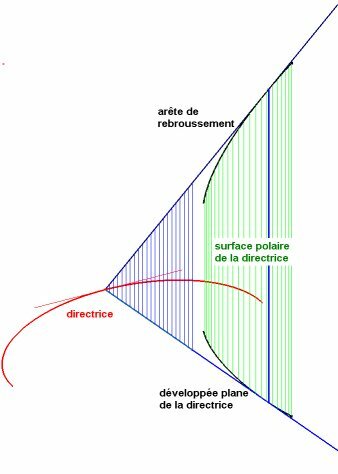 The cuspidal edge, envelope of a normal to the directrix, is an evolute of the directrix, and it is a helix for the polar developable of this directrix, which is the cylinder constructed on the planar evolute of the directrix. Inversely, the directrix is an involute of the cuspidal edge. 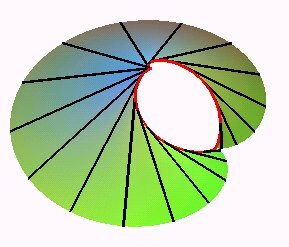 The projection of the cuspidal edge on the plane of the directrix is the envelope of the normals to the directrix, i.e. its planar evolute. 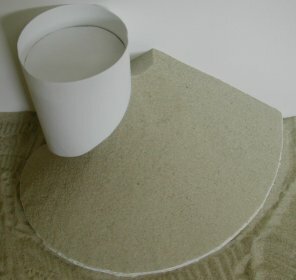 These surfaces have the remarkable property that they can be physically modeled, in part, by saturated sandpiles. 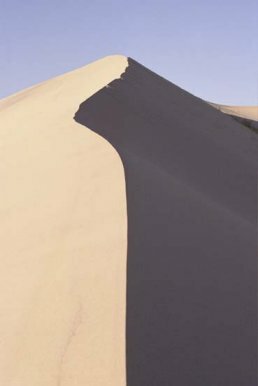 Indeed, a grain of sand, placed without initial speed on a sand pile rolls and slides if and only if the tangent to the slope line forms with the horizontal an angle at least equal to a value that depends on the sand used (around 30°), and its trajectory is a slope line. Similarly, embankments, ballast, rubble, scree, have a surface that approximates a surface of constant slope. 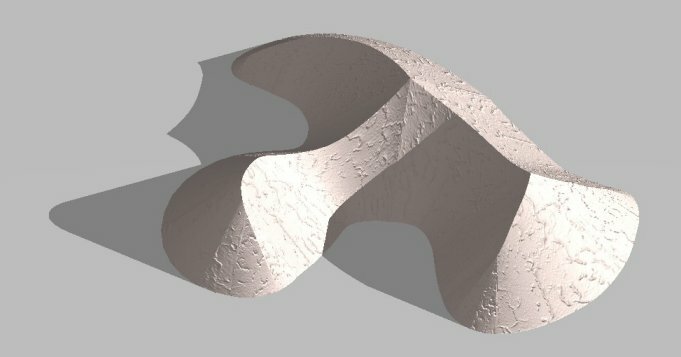 Given a compact K of xOy the boundary of which is a curve (G), define the sandpile surface with bank (G), as the surface with equation when (x, y) describes K, where is the distance from the point (x, y) to the curve (G). 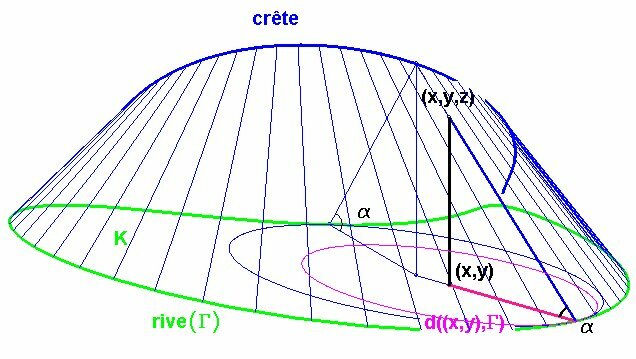 This surface is composed of a part of the surface of constant slope with directrix (G) to which can be added portions of cones of revolution. 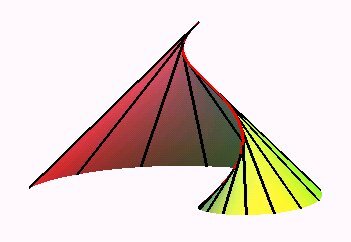 It is the envelope of the family of trunks of cones of revolution with angle at the vertex equal to the complement of a and the base disk of which is included in K and bitangent to its boundary (the bank (G)). 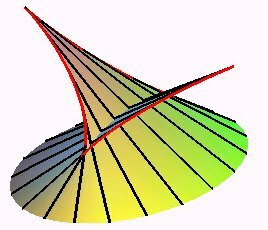 The locus of the vertices of these cones is called the ridge; it is the curve the projection of which is included in the set of points at same distance of at least two points on (G), sometimes called the skeleton of this curve (see equidistance curve). the projection of the cuspidal edge (not visible here because it is too high) is a semicubical parabola. 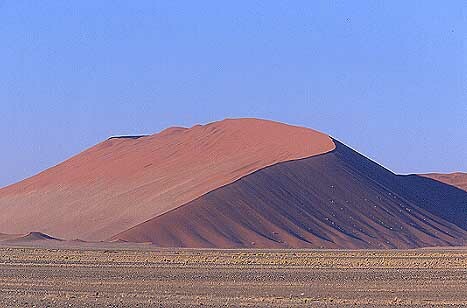 France as a sandpile: the projection of the highest point gives the farthest point from the boundary (at 10km north of Bourges).